As the end of the year approaches, you and your accountant will need to complete certain tasks in QuickBooks Online to close out the old year and prepare for the new one. The following sections can help guide you through these end-of-year tasks to make the ending of one year and the beginning of another easier. It's important to ensure that the correct month is selected for the start of your fiscal year to allow QuickBooks to clear accounting ledgers behind the scenes while you work on other end-of-year activities. Your fiscal year is confirmed. At the end of the year, it's a good idea to ensure your client base has up to date account balances and that billing and payments are all up to date. can settle any outstanding customer payments. Under the Reports menu, select Customers & Receivables and choose either A/R Aging Summary or A/R Aging Detail. Review the report to identify customers with outstanding balances. Once you identify outstanding balances, you can send statements to the customers. Customers menu, go to Statements/Create Statements. Choose the appropriate A/R account.Note that QuickBooks displays the A/R Account field ONLY when your Chart of Accounts contains more than one A/R. Select the date period of the transactions. Note: You can specify the dates or you can include all open (unpaid) transactions as of the statement date. Choose the customers you want to print statements for. Select Print or E-mail depending on how you want to send the statements to your customers. You should also confirm that all deposits are cleared from the deposit queue. Any funds sitting in this queue will not be included in your current year's income. For information about creating deposits, see How the Undeposited Funds accounts works. The end of the year is a good time to take care of any outstanding bills you owe for the year, and address any outstanding credits, discounts, or products you're owed from your vendors/vendors. Under the Reports menu, select Vendors & Payables and choose either A/P Aging Summary or A/P Aging Detail. Review the report to identify any outstanding bills to pay before the end of the year. Once you identify any outstanding bills, you can clear them up before the end of the year. It is good practice to match your QuickBooks data to your bank and credit card accounts to ensure that all transactions have been recorded correctly, and that your year-end reports display accurate financial data. For more detailed information about the reconcile process, see reconcile an account or the Desktop Reconcile Hub. Your accountant has the expertise necessary to give you suggestions on data input, help with your year-end process, and forecast your company’s financial future. QuickBooks Desktop makes it so that you can save the accountant's file locally, but also share it using the transfer service to send it electronically and safely. To understand the Accountant's Copy, process, please see the Overview. It's important to run year-end reports to review the information and identify any issues or discrepancies. Locate and review the Profit and Loss report and the Balance Sheet, as well as any customized reports you or your accountant require. You and your accountant can review the information in these reports to identify any potential issues to resolve. It is also important to understand how QuickBooks makes automatic adjustments at year's end, in preparation for the upcoming fiscal year. If your Retained Earnings need to be divided among owners or partners, your accountant can assist you. It's good practice to have previously set up an Owner's Equity and Draws ledger for any payments or withdrawals from the company during the year by the key people who founded the company. Choose Make General Journal Entry. Taxes are typically prepared by a company's accountant. When you send your accountant an Accountant's Copy file, you give the accountant access to all the financial information they need to prepare and file taxes on your company's behalf, and to make any necessary changes. Your accountant can use this information to prepare, or help you to prepare, any required year-end tax return. 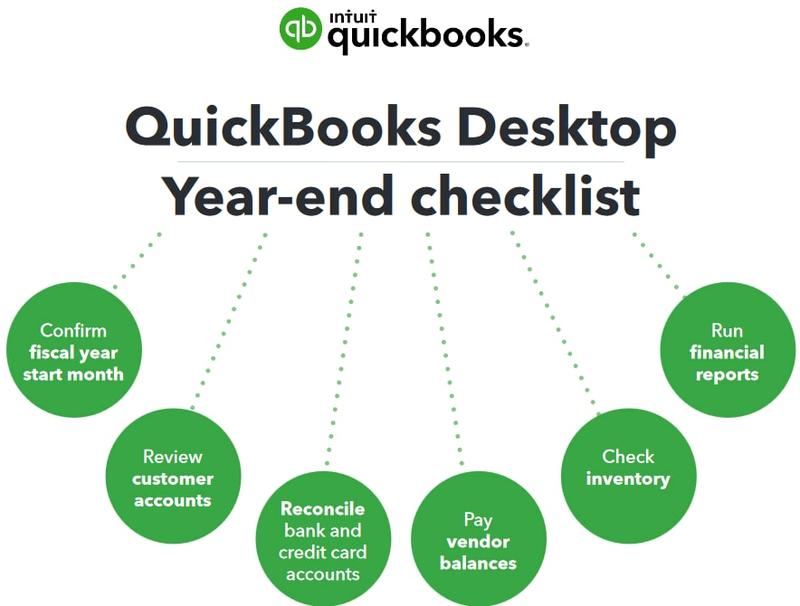 QuickBooks Desktop does not require you to close the books as part of Year-End. However, it does offer the use of a closing date password to limit access to the closed accounting period. From the Edit menu, select Preferences then Accounting. Under Company Preferences, select Set Date/Password. (Optional) Choose your closing date and set your closing date password. Select OK to close the Set Closing Date and Password window. Note: To remove the closing date password, log in as the admin and remove the encrypted password on the Set Closing Date and Password screen. For more detailed information setting the password, see Set, change or remove closing date and closing date password.